More than a dozen Mississippi residents said that emergency services, at times, struggled to find their way to those who called for help. GREENVILLE, Miss. — Stephanie Park, 70, waited with the body of her neighbor for two hours before the Washington County coroner could make it to his house here in the Mississippi Delta. Rigor mortis had set in. About 15 miles to the southwest, Lori Gower, 57, had to drive her Dodge Charger through a nearby farm field swamped by heavy rain to get to her house after work. The car’s engine flooded and her husband, Mack, 64, had to tow her out. Mack, for his part, couldn’t get his diabetes medication delivered. Just 50 miles north, Rives Neblett, 75, a Delta farmer, has watched the production cost for each bushel of soybeans increase by more than seven cents because his harvest truck has to take circuitous routes. The source of all four Mississippians’ troubles: Bridges that were closed. And not temporarily closed because of accidents or flooding, but closed because of old age, splintered supports, or cracked concrete. Mississippi, a relatively poor state, has never been known for its gleaming transportation network, but the situation today is worse than ever. Across the state, residents now have to circumvent nearly 500 closed bridges that have been declared unsafe, according to the Mississippi Office of State Aid Road Construction. Another 1,742 are posted with specific weight limits because of structural deficiencies. Combined, that accounts for more than 20 percent of the county and local bridges in the state. While the bridges have closed, more money to address their inadequacies has not been made available, because increasing taxes is a non-starter for the Republican-controlled state government. Without a solution, county workers tear up the asphalt just ahead of the bridges here and put up florescent orange signs to warn oncoming drivers that the crossing is out. The new roadblocks force many people throughout this state to drive dozens of miles out of the way to get to work or even drive their car through the flood-prone dirt at the edge of a farmer’s planted field. In Mississippi, many concrete crossings used by heavy automobiles and tractor-trailers depend on wood supports. These timber pilings of southern pine are hardly ever seen or noticed, but over the years, many have become cracked and weathered by the ever-moving water table and baked by the pudding-thick Mississippi heat. These bridges may only connect roads over a small ditch or a dried creek bed, hardly noticeable for the few feet of support they provide, but those gullies are commonplace in this floodplain. The loss of a small bridge often isolates those who depend on them. It has also put families and the elderly in dangerous positions. More than a dozen Mississippi residents told NBC News that emergency services, at times, struggled to find their way to those who called for help. And this is a problem for the entire state, not just for the rural poor here in the Delta. It hamstrings Mississippi’s businesses and industries and puts residents in difficult predicaments. The state, county and local governments, however, all lack the funding to fix it. Leaders have scrambled for solutions. One often-proposed remedy for the state is to raise the fuel tax. Never adjusted for inflation, the tax has not changed since 1987. In the ensuing 31 years, inflation increased more than 115 percent and the cost of construction grew at 10 times the rate of the state’s gas tax revenue, according to the Mississippi Department of Transportation. Two bridges closed by the county left Park, a retired school teacher, without an easy way to leave her old farmhouse, which sits between crowded, green cornfields. The only way out for 10 months was down a bumpy road of orange dirt that became treacherous once rain turned it into a muddy pond. Spring storms left her trapped for almost three weeks. Six houses in the Western Hills Community Association in Jackson, Mississippi, have been put up for sale in the past month after the bridge that directly connected them to the state capital closed around six months ago. Dorothy Johnson, 63, has lived in this predominantly black neighborhood for a decade and is now worried that emergency services will not be able to reach her in time in case of an emergency. After all, it took them almost half an hour to find a route to her house when her carbon monoxide alarm went off. Anita Grey, 48, moved into the neighborhood six months ago, days before the bridge closed. Her problem isn’t with the additional 10 or 20 minutes to the city proper but with how her tax dollars are spent, particularly when wealthier communities seem to see quicker fixes. The question of where tax money ends up is often put to Lt. Gov. Tate Reeves, who leads the state Senate and refused to consider any bill to address the issue that would increase state revenue via taxes. His remarks have become more fraught, however, after the Clarion Ledger newspaper, based in Jackson, reported earlier this month that the Mississippi Department of Transportation faced political pressure from the Senate and the lieutenant governor’s office to build a $2 million drive to Reeves’ gated community. Reeves denied any involvement in the project and sent a letter to MDOT demanding they prove the allegation, “so I can investigate and take corrective steps if warranted,” he wrote. After receiving the letter from Reeves late last week, MDOT said that it was examining Reeves’ request and putting his neighborhood’s project on hold because there was not a major need for it. Mississippi Attorney General Jim Hood, a Democrat expected to run for governor next year, announced last week that his office would launch his own investigation into the matter and sent a letter to more than 50 state officials requesting that they preserve any related records, according to Mississippi Today. The state’s longtime infrastructure and bridge question came to a head in April, when the Mississippi legislature failed to pass an infrastructure bill sponsored by Reeves that would have forced local and county governments to bear a large portion of the costs. Without a solution and under pressure from the federal government, Gov. Phil Bryant, a Republican close to the Trump administration, ordered the state to close more than 100 additional bridges because they didn’t meet federal standards. “These bridges have been deemed unsafe for the traveling public," Bryant said in a statement. "Keeping them open constitutes an unnecessary risk to public safety, violates the corrective action plan agreed upon by the state and federal government and jeopardizes federal infrastructure funds Mississippi receives." That could just be the beginning: State engineers said that federal inspectors have not finished examining all the bridges and would return to reinspect all of the timber bridges again — meaning further closures could be on the horizon. “We’re hoping it’s not as bad this year,” said Assistant State Aid Engineer Lanny Glover. Reeves’s spokeswoman declined multiple interview requests on his behalf, but explained that the lieutenant governor pushed for a $1 billion infrastructure plan — the so-called BRIDGE (Building Roads, Improving Development and Growing the Economy) Act — which failed to pass before the end of the legislative session. The bill’s requirement for cities and counties, already in dire financial straits, to match any state funding provided for road and bridge repair became a major sticking point as the legislative session came to an end. That, in part, caused the proposal’s undoing. “The lieutenant governor has had many productive conversations on this issue since the end of the session and looks forward to further discussion with the House leadership,” the spokeswoman said. Once those discussions are completed, Bryant is expected to call a special session of the Mississippi legislature, which could occur in late summer or early fall. But many remain unconvinced that a long-term solution will be found, and constituents as well as legislators are looking to next year’s statewide election to express their frustration over the ongoing bridge crisis. Most anticipate Reeves will run for governor in 2019. Jerry Redmond worked in law enforcement for 30 years before being elected to the board of supervisors in Washington County, a strip along the Mississippi River of rich soil, farm fields and single-stoplight communities punctuated by desolate downtowns. 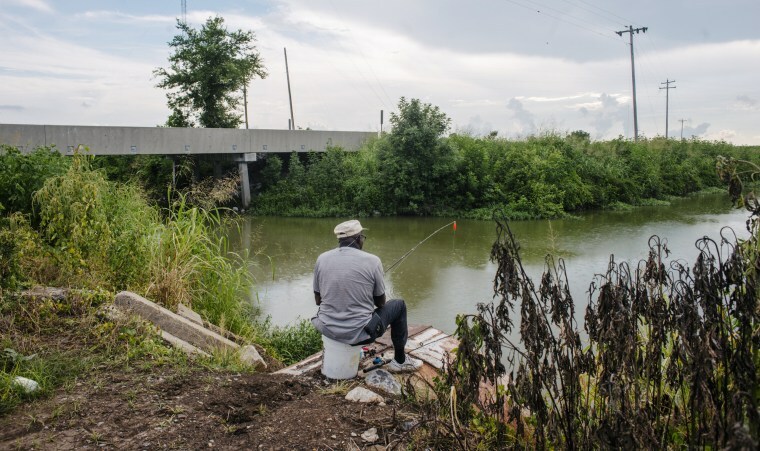 He said this county in the Mississippi Delta, which suffers a declining population and a poverty rate of nearly 35 percent, needs about $10 million to comfortably fix its infrastructure troubles — the bridges, as well as its cracked and pothole-ridden roads. Washington County, worse off than most, has few options. According to Redmond and that preacher, county supervisor Jesse Amos, the county has used up almost all of its multi-million dollar road budget addressing the bridge closures. It now has just $37,000 for the rest of 2018. That’s not the only budget affected. When the feds and state demanded immediate closures in April, the county had to spend nearly $27,000 on signs — its entire sign budget — because so many bridges are closed or being fixed. Everything here is operating on a shoestring. The Mississippi Economic Council estimated that the state needed to increase its annual infrastructure spending to $375 million to fix and effectively maintain the road and bridge networks in the state’s 82 counties — a recommendation supported by 223 business leaders from across the state. Redmond affirmed that the money provided by the state government isn’t enough to fulfill the standards set by the federal government, and yet more than 70 percent of roads and bridges in the state fall under city or county jurisdictions. That leaves county road crews working constantly while the board attempts to come to the aid of angry constituents and find new funding for the numerous construction projects. Dale Lewis, the assistant county road manager, said that county workers can’t seem to get ahead of the curve. Just as he reopened three bridges at the end of June, he was told to close two more. Because of that, the county has often turned to temporary options. An inexpensive workaround that only takes a day or two to install is to convert an old railroad tank car into a pipe by cutting off its ends, lowering it perpendicular to the area that needs to be crossed and covering it with gravel. Water is able to flow through the open ends of the tank car and most vehicles can drive across the gravel layered on top, as the 1/2 inch-thick steel rail car can support up to 50 tons. But that leaves the asphalt bridge unrepaired and forces motorists to depend on gravel roadways to get around the now useless piece of infrastructure. The culvert, as the shortcut is called, allows workers and the county to move onto the next project, however, as time and money run short. Mike Morgan, president of the board of supervisors in Hinds County, the largest county by population in the state, said the biggest problem at the local level is that the only power that local and county governments have to increase their budgets is to raise property taxes, which doesn’t yield a huge sum and is an unpopular option. Rives Neblett is a longtime soybean farmer in the Mississippi Delta, operating thousands of acres across Bolivar County. Times are tough for farmers in the region, he said on a steamy Tuesday morning in Shelby, Mississippi. With the Trump administration pursuing a trade war with China, a major purchaser of soybeans, Neblett’s margins are shrinking. What makes matters even worse is the seven to eight cents per bushel that he is hemorrhaging in transportation costs because of the state’s bridge closures. Neblett must regularly move his crop to the closest grain elevator on the Mississippi River, where it can then be shipped to New Orleans. Due to closed roads and bridges, he must now bear the cost of driving trucks over 18 more miles of cracked asphalt roads. Mississippi’s economy as a whole is dependent in many ways on those roadways because its main industries are agriculture, timber, poultry and manufacturing — many of which rely on shipping along the Mississippi River — said state Sen. Willie Simmons, a Democrat who chairs the state Senate’s Highways and Transportation Committee. Driving these roads, it’s not uncommon to be stuck behind a slow-moving tractor, trucks stacked with caged chickens, log trucks with precariously balanced lumber in tow, or a grain truck stuffed to the breaking point with recently harvested crops. Many of the owners of those businesses are increasingly frustrated by the bridge closures. “We need a good infrastructure system because when we have deficient bridges it causes those industries to spend extra dollars to get around them,” said Simmons, noting a fear that the state will not only lose its few industries but not attract new ones because of the ongoing crisis. It also could have an effect on Mississippi’s very makeup: The state’s millennial population dropped by 801,799, or nearly 4 percent, between 2010 and 2016, the largest decrease in the nation, according to a GOVERNING Magazine analysis. Factors for their departure are often tied to a lack of opportunity in Mississippi and discontent with how the state operates. Billy Redwine, 54, said it’s not just young folks who have had enough. Redwine, who owns an auto parts store and towing service outside of Greenville, grapples with three closed bridges within a mile of his shop. It’s caused customer interest to decrease to a trickle and fueled his frustrations with the state. Not to mention that one of Redwine’s brothers already gave up and moved away, and another is preparing to do the same. CORRECTION (July 27, 2018, 5:15 ET): A previous version of this article incorrectly attributed statistics about gas tax revenue. The figures are according to the Mississippi Department of Transportation, not the Mississippi Department of Education.